The question is: When you hear the call of the Aeolians, will you be adequately prepared? And thanks to the next few paragraphs, the answer will be yes. 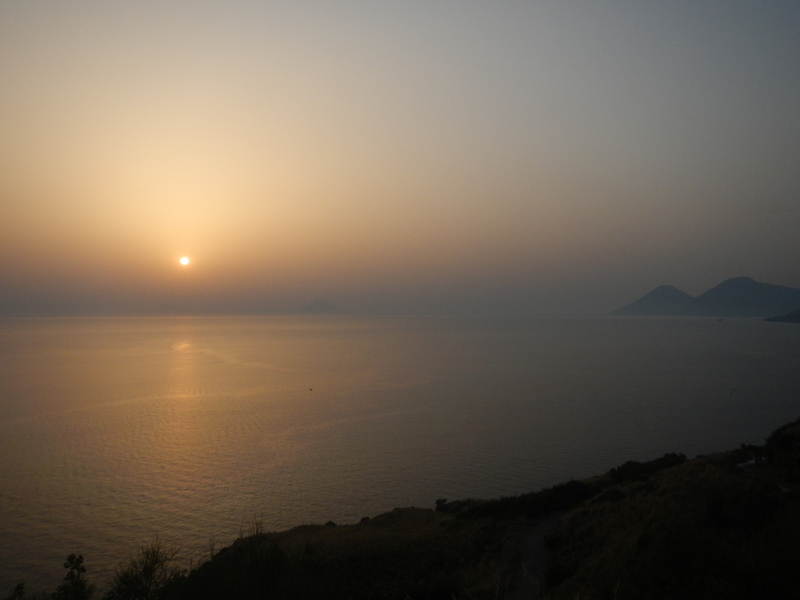 Dramatic, isolated and intensely varied, named after the demigod of the winds Aeolus, it is easy to see why the Aeolian islands have figured so often in ancient myth. Here are a list of some of my favorites. Evidence of intense tectonic activity is evident along the whole of the volcanic “Eolian Arc.” Even under the water, hot bubbles floating up from the ocean floor serve as a reminder of the turbulent underworld beneath. For most of the tourists who frequent Vulcano — the nearest of the Aeolians to mainland Sicily — the hot pools are the furthest they get. Close to the harbor, a quietly smoking crater towers above the day-trippers wallowing in stinky mineral-enriched clay. What with the crowds and the stench of rotten eggs, you could be forgiven for thinking you had taken a wrong turn somewhere and found you had ambled into one of hell’s slightly more picturesque outer circles. If you want a glimpse of what paradise looks like, find your way to the bay at Polara on the island of Salina. This isn’t paradise in the wishy-washy flowers in your hair, white sands, strum on a battered ukulele sort of paradise. This is stunningly dramatic glimpse of the sublime — dizzying and perfect. I resisted the temptation to post any pictures because they do not really do it justice. As the sun set on this magnificent cove we met a trio of backpackers who, like us, carried with them only a tent. And, as they informed us, equally at a loss as to where to pitch it, the only campsite having been closed down. Together we grasped the concept of wild-camping with much aplomb, sleeping that first night among the cactus’s and long grasses that skirted the cliff tops lining the bay. Cliff tops which did, incidentally, serve as a backdrop to the 1994 film Il Postino (The Postman). Most of the images that churn up when you Google “Filicudi” depict a rather phallic shaped boulder poking out of the sea. While it is a rather impressive specimen — if not rather intimidating for some — and as inexplicably drawn to it as you may be, again do not let it distract you from discovering the rest of the island. Due to its relative distance from Sicily, there are barely any tourists — or anybody at all for that matter. And there is certainly no such thing as a campsite or a hostel. But this is actually highly conducive to excellent times. As long as you keep a low profile and leave nothing but footprints (as the saying goes), there are some fantastic pitching options. Just keep an eye out for wild dogs. 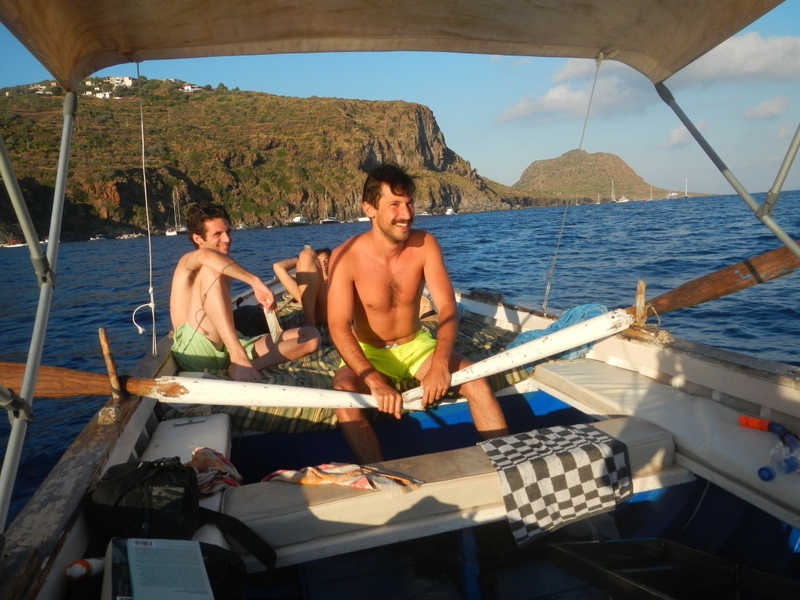 Furthermore, for the cost of approximately 100 euros, you can hire your very own boat for the day, giving you the freedom to mooch around the coastline as you please. The snorkeling here is absolutely outstanding. Be aware that this will be a rather informal arrangement and acquiring an Italian speaker to assist you in negotiations is advisable. “The island of a thousand steps” is the most remote of all the Aeolians. This is an escape favored by the rich and famous, something we certainly were not, but which served us extremely well as we found ourselves enjoying the hospitality of an Italian film director at his hilltop villa . . .
Not that he was aware that we were taking advantage of his hot outdoor shower and vine-shaded sea-view terrace, for this came courtesy of the house’s caretaker, who kindly allowed us a night in the protection of the mansion in return for keeping an eye on it for him. Blissfully quiet at night, this is throwback to a bygone era, where the few permanent residents fish for their supper and harvest from the land. And where it seems almost guaranteed that you will live to be around 150 years of age, thanks to a diet of sun, stairs and olive oil. The lack of options for accommodation, combined with Alacudi’s distance from the mainland has ensured that this is a place the widely sought continue to find haven and the countless shooting stars can continue to fall, silently unobserved, through the soft caverns of the night.